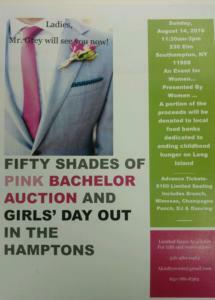 Fifty Shades of Pink Bachelor Auction and Brunch- Girls’ Day Out In the Hamptons Sunday, August 14, 2016, 11:30am-3pm. An event for Women by Women. A portion of the proceeds will be donated to local food pantries dedicated to ending childhood hunger on Long Island. Advance Tickets $100- includes Brunch, Champagne Punch, DJ and Dancing. Come bid for a dance with your favorite bachelor.